TRI-FOLD PACK N' PLAY MATTRESS - Using the highest qualities with your babies satisfaction in mind we've created the ultimate foldable mattress for babies measuring in at 37.5 x 26 x 1.5 with rounded corners to make sure your NapYou Pack and Play mattress can perfectly fit into any Pack n Play. ORGANIC COTTON - Soft to the touch, we've made the tri-fold Pack n Play mattress with organic cotton and polyester blend so not only will it be durable, but extremely soft to the touch for your baby. BONUS EASY HANDLE CARRY BAG - We've included a convenient carry bag with the Pack and Play mattress that you can conveniently fold up and place in the bag along with a small blanket. 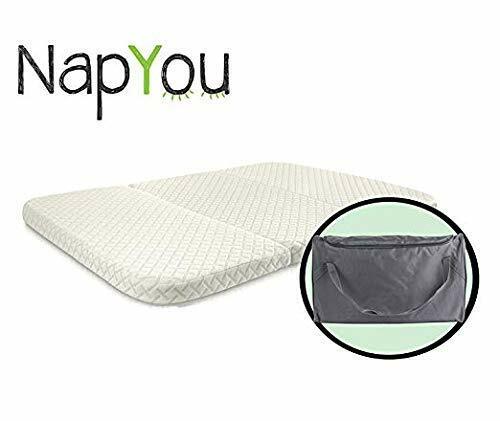 USE WITH OR WITHOUT A PACK N PLAY - The NapYou Pack n Play tri-fold mattress is designed to be used with or with an actual Pack and Play, which can make a perfect sleeping mat.